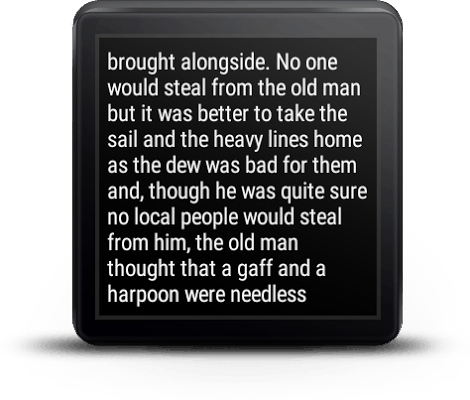 Last night's post on the PDF-reading app for your smartwatch got me thinking about the general difficulty in finding information about reading on smartwatches. So here's what I have learned about how you find reading apps for your Android Wear smartwatch. Before you do anything else, go install the "Store for Android Wear" app from Google Play on your Android tablet or smartphone. That app is a special store which only carries apps for Android Wear, and it saves you the effort of sifting through Google Play for compatible apps. You can also search that store and find that there are two Feedly compatible apps for Android wear, Feedly and Palabre. The latter app also works with Inoreader, The Old Reader, or Twitter, and it can even operate independently (just give it the RSS feeds). And if you don't fancy catching up on the news, perhaps you would like to read an ebook. The major ebook platforms do not support Android Wear, but you can find a few reading apps. There's Reader for Android Wear, for example, but it only displays text files. The free Wear Reader, on the other hand, supports Epub, PDF, Docx, and text files, but it's a speed reading app so it won't be for everyone. If you're more interested in reading than speed reading, then perhaps Wattpad might be your thing. The Wattpad Android app supposedly supports Android Wear (although I have yet to confirm that detail). And even if the Wattpad app proves to be a bust, there's still Reader for Watch (Wear), which supports Epub, FB2, and txtt files. This $1 app mention voice search in its feature list, and it even has several alternate color themes. And of course there is also the previously mentioned PDF Reader for Android Wear. Speaking of PDFs, if you want to get work done or read a spreadsheet, Word file, or presentation, there's an app for that. But let's be honest; it's hard to read on a one and a half inch screen. Audio would be a better choice for many people, but alas, I can't find any audiobook apps for Android Wear. I found music apps a plenty, including a half-dozen that will let you play your own MP3s, but I couldn't find an app which supported audiobooks specifically. Edit: A reader has told me that the OverDrive Android app supports Android Wear, and will let you control audiobook playback from a smartwatch. Thanks, Robert! Do you know of an Audiobook app for Android Wear? Is there a type of app you're looking for that isn't mentioned above? Let me know in the comments, and we'll see what we can find. Nate, off-topic: The share options on The left part of the screen gives some trouble to read on five inch (or less) screens. Sorry for the broken English! Thanks for telling me about the problem. let me see if I can fix it. The OverDrive app includes Wear support for audiobooks, both via the default media notification on the watch and an actual Wear app that adds a bit more functionality. Thanks! I didn’t find that anywhere! Let me go fix the post. Edit: I still can’t find that info in Google or elsewhere, so let me go ask OverDrive for help. The app listing in Play lists it as Enhanced for Wear and includes screenshots of the Wear app if you swipe through them far enough. There are two apps enabling to read texts without scrolling – those are Spritz and Fast Reader (by FutureExpLabs). According to Spritz site, it only supports Samsung Gear 2 and Noteband. And as for Fast Reader, it’s really unstable and I haven’t found the developer’s site and supported devices info.